Rugged utility meets refined luxury in the 2017 Ford Explorer. Available onboard features such as intelligent four-wheel drive, hill descent control and a terrain management system mean you can forge ahead into the wilderness without fear. At the same time, an interior with three rows of seating, plenty of space and clever amenities means you won't ever be truly roughing it, no matter where your travels take you. The standard engine is a 3.5-liter V-6, which puts out a respectable 290 horsepower and 255 lb.-ft. of torque. 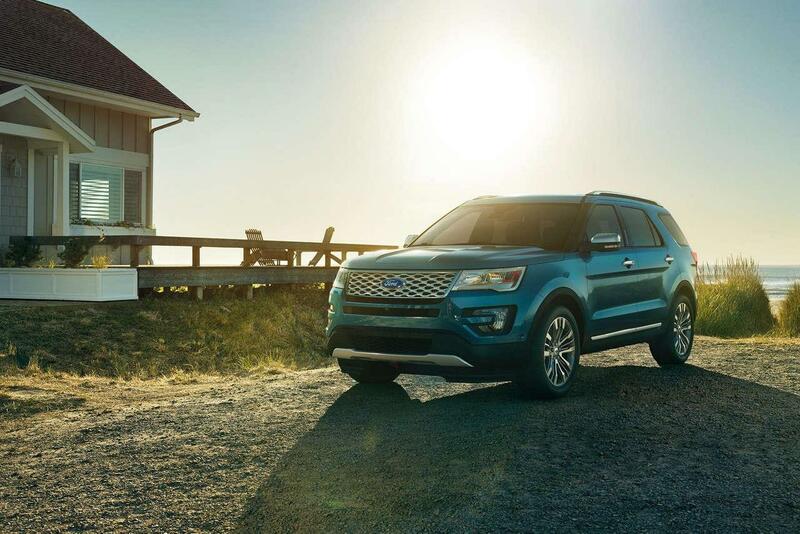 To help with conserving fuel without compromising on performance, the 2017 Ford Explorer can also be had with a 2.3-liter EcoBoost engine that puts out up to 280 horsepower and 310 lb.-ft. of torque. For maximum capability, a 3.5-liter EcoBoost V-6 uses direct injection and turbocharging to push out 365 horsepower and 350 lb.-ft. of torque, completely outclassing rivals. Thanks to a number of standard features on the 2017 Ford Explorer, everyone is protected from a number of potential safety risks. A rearview camera provides an excellent view of other cars, people or other objects behind the SUV. Trailer sway control integrates with AdvanceTrac with roll stability control, automatically using the brakes and restricting engine output to prevent risky situations. Hill start assist and curve control are standard, while other advanced technologies such as a front camera and sensing system and lane keep assist can be added. A functional interior provides plenty of room for people riding on all three rows, plus 21 cubic feet of cargo space behind the third row. A clever storage compartment in the floor at the back of the SUV accommodates smaller items, keeping them safely contained. Ford offers a hands-free, foot-activated liftgate for the 2017 Ford Explorer, making it possible to operate while carrying large items. The rear portion of the front center console can be outfitted with dual smart-charging USB ports, letting people on the second row plug in their mobile devices. Another option is a navigation system with SiriusXM Traffic and Travel Link, which includes voice-guided turn-by-turn directions and 3-D mapping.